Time to Start Looking For Bargains! So I thought I would write something about what my current investment strategy in the precious metals mining space is. You probably know that I have a large position in a highly speculative exploration stock called Novo Resources. If you think we are currently in a long term precious metals bull market as I do, I think it is a good thing to not ONLY be in high risk/high reward exploration stocks since you risk missing out on all that sweet beta if you are unlucky. Given that precious metals miners are truly hated at the moment, I am becoming increasingly greedy. I would argue that especially many of the gold miners are looking very attractive in terms of valuation. Given the amount of insider buying from some very prominent mining investors I guess I’m not the only one who thinks that. The best part is that it’s not only the mediocre “optionality” plays that are cheap, but also high quality companies with a lot of current value coupled with growth prospects. Basically what I’m saying is that I believe there are quite a few companies trading at such depressed levels that you get the known value at a discount and any potential future success (expected value) more or less for free. Sure, some companies were trading even lower at the end of 2015, but many companies have also gotten better (lower costs etc) and/or proved up more resources. That means that there might be some really good bargains despite the fact that the stocks are trading at a higher level simply because the increase in value has outpaced the rise in valuation. So at the moment I am mostly interested in buying good gold companies and that space is where my current focus is even though I’m a huge silver bug. I mean gold itself is not far off from multi year highs while some quality gold miners are trading 50%-70% below their 1 year highs even. Silver on the other hand is pretty far away from it’s multi year highs and the performance in the silver stocks reflect that reality, much more than gold stocks anyway. In short; I believe that the best Risk/Reward (most bang for the buck) can be found in the gold mining space today. A good example (IMHO) is a company called Superior Gold which is trading at an EV/FCF multiple of 2.8 annualized based on the latest quarterly report. This small Australian gold producer is raking in some serious cash (relative to its size) on top of having plenty of cash in the bank. Gold has to fall quite a bit from here before many gold companies are facing solvency issues. You can’t really say the same for the silver miners. A lot of silver producers are already facing a lot of headwinds at these silver prices, which means they have a lower margin of safety in the event of further declining silver prices. Given that I am currently looking to buy mainly gold stocks the next logical question is what kind of gold stocks. Well, first of all I am not interested in royalty/streaming companies (unlike many others). I think they have had their day in the sun long enough and that their past successes has led to many streamer being pretty fairly valued and I’m not looking for fair value, I am looking to buy the stocks that are unfairly cheap (contrarian company bets within a contrarian sector bet). A best case scenario would be to be able to buy a stock that is trading at a discount to the known facts while at the same time pricing in nothing in terms of exploration and/or development upside. I truly believe that the current environment is absolutely perfect for retail investors that put in the hours of research in order to find the true gems, the true alpha plays that can unlock out-sized returns in the future. 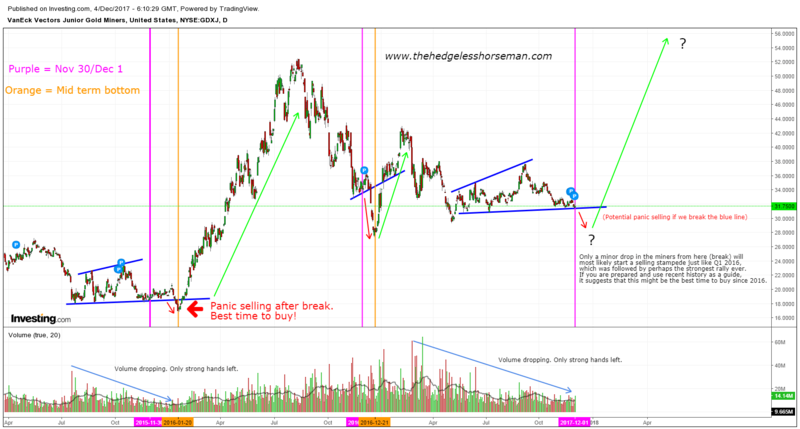 I believe the coming 30-60 days and how one maneuvers during this relatively short period of time is going to be critical in terms of beating the market… I think it will test your fortitude and you will discover if you are truly able to actually buy low in order to sell high later, and not the other way around. I am personally putting together my own “shopping list” of companies that I believe are already undervalued right now (and thus have been buying last few weeks), and that I will be more than happy to plow even more money into, if we get the typical Dec/Jan panic selling in the mining space. Don’t forget that we are still in tax loss selling season that might bring early Christmas gifts to the prudent and patient investor. The drop in volumes suggest that there are only a few weak hands left and that a lot of the outstanding shares are now in strong hands. One final “tree shake” would probably be enough to make the last of the weak hands sell their shares to the smart money and set the stage for another massive rally. Remember, the herd always lose. Note: These are only my own strategies and what I believe might play out in the near future. Always do your own due diligence and be aware that this is sector is associated with high risk and high volatility. Thus, investing in miners is not suited for everyone.